Natraj Machine Manufacturers has evolved from a heritage of over twenty years of study, experiment, research and successful applications in the plastic machinery industry. The company is started by engineers, technicians led by the expertise of Mr. Babubhai Mistry & Mr. Premkumar Mistry a brilliant experience in developing Plastic Injection Molding Machine applications. The plant of Natraj Machine Manufacturers is located at the Saraspur area with complete infrastructure, enriched with skilled human resources. The company manufacture Injection Molding Machines, Plastic Insert Molding Machines, Plastic Injection Molding Machine, Vertical Injection Molding Machines, Horizontal Injection Molding Machines, Automatic Injection Molding Machines with the best in the world. To us each client is different and each creation different. Our attention to custom requirements is legend, so that every client considers himself to be the only customer. 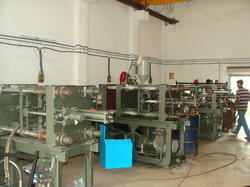 Manufacturing and Trading of Plastic Moulding Machines. Quality is our biggest strength. Our products are known for quality and reliability. We are known for providing fault free hydraulic machines. We manufacture machines, which suit the most extreme environments of our clients. We maintain strict quality checks at every stage of product development and take adequate measures to ensure that our machines abide by international quality norms. • Conformance to the requirement of the application. Our infrastructure possesses a modern state-of-the-art-technology and high-tech machines that ensures high efficiency and precision engineered hydraulic machines. Our machines are designed with sophisticated technologies and latest tools. Most of the components used are standardized, hence available world-wide. With a passion for excellence and innovation, we manufacture and export an exclusive range of hydraulic machines that have helped us set a benchmark for us in various international market. Our company specializes in manufacturing precision engineered machines, which are economical, durable & have high efficiency. We ensure that every machine is designed & developed as per specifications laid by our esteemed client. Our company endeavors to provide customized packaging solutions for every machine. We truly believe that customer is the king. Hence, all our products and services are directed to achieve 100% customer satisfaction and our obligations don't end with the sale of our products. In order to establish long term commercial relationships with our customers, we provide excellent after-sales services, while maintaining a comprehensive back-up of spares & services. We have a team of service engineers, who are responsible for providing efficient & prompt after-sales-service on the field. Additionally, we also maintain a complete after-sales-service network and sales & service agents in different countries. Along with sophisticated technology, we are manned by a diligent team of highly experienced & hard working engineers and technicians. With our industry knowledge, we are able to manufacture fault free machines. We have a team of service engineers, who are responsible for providing efficient & prompt after-sales-service on the field. Additionally, we also maintain a complete after-sales-service network and sales & service agents in different countries. We do care for our customers and we are engaged to fulfill the needs of our customers. Our rich experience in this field, helped us in gaining expertise in this profession of the business. Our all the products are of best quality and in accordance to the Industrial standards. We have a large manpower of over 50 people, which are highly skilled and dedicated. Our team works dedicately to provide high quality service to our customers. They are supported with advanced machinery and tools which help them in producing best products.